If you are staying in Uvita or Dominical on your Costa Rica vacation you have probably done your homework to find this lesser known hidden gem. Quietly touted as one of Costa Rica' best surfing destinations, the small hippy town of Dominical attracts surfers from around the world to enjoy surfing, kayaking & other watersports from it's from its hidden shores. 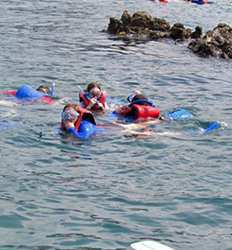 So it is no wonder that Dominical surfing and watersports are the most popular things to do in Dominical and we have a great selection of fun activities for you to enjoy. Whether you are an avid surfer or a first timer, The Real Deal Tours offers Dominical surfing lessons and excursions for all skill levels. Our expert bilingual surfing guides will ensure you catch the perfect wave in the best surf breaks in Dominical. 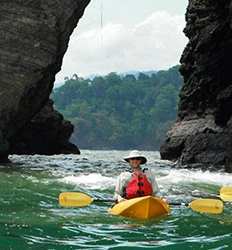 If you prefer to paddle your way through the waves, we offer a couple great sea kayaking tours in Dominical & Uvita too! Wish to slow down the pace a bit? If you get tired of the beach, The Real Deal Tours also offers a relaxing lazy river float on the Baru River which is fun for the whole family! If you are a nature lover, our mangrove kayaking tour is the perfect choice for you. Whatever your passion may be, when it comes to Dominical watersports, we have you covered! Below we have compiled a list of surfing and watersports tours in Dominical & Uvita region available to you. When you book with The Real Deal Tours you know you will be getting the best deals in Costa Rica on the best watersports & surfing tours in Dominical. So, choose one or enjoy all the surfing & watersports in Dominical you want, the choice is yours! Whether you´re new to the sport or an experienced surfer looking to hone your skills, our Dominical Surfing Lessons are the perfect way to experience what´s considered to be one of the best surf destinations in Costa Rica. 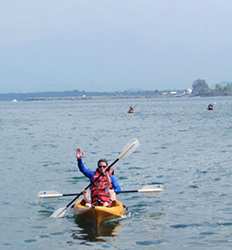 The Real Deal Tours offers private lessons for beginners, intermediate and advanced. One of the most stunning parts of the Costa Ballena coast, Playa Ventanas is often called the most beautiful beach in Costa Rica by locals. With lush green coastline and impressive cave formations that stretch from the sandy beach into the ocean forming “windows” and giving name to the beach. Just north of Dominical, the beaches meet the rainforest and come together to create a magical mysterious habitat where the creatures of the jungle forest and the water co-habituate. Our expert bilingual guides are here to help you unlock the mysteries of their unique environment.